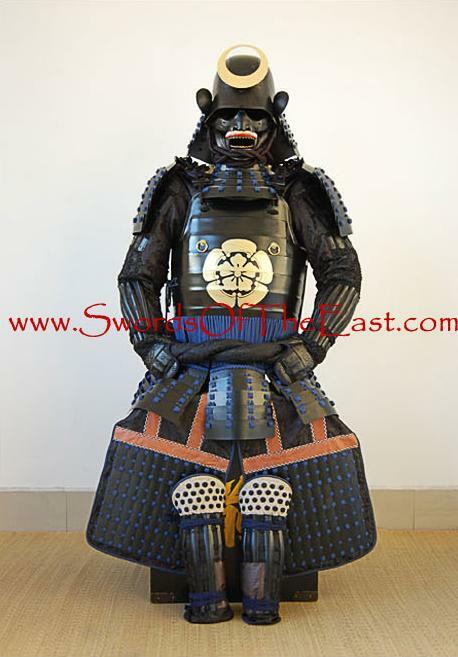 This very affordable reproduction of classic style Samurai armor, worn by Oda Nobunaga's clan (C003), is constructed by the highly skilled craftsmen of Fenglin armory and incorporates all of the elements of a suit of Japanese samurai armor (armour) of the period. The crest of Oda Nobunaga is hand painted onto the chest (do) in gold. The armor is wearable (within a reasonable size range) and is fully functional. Supplied in the customary black lacquered box which, along with an included wooden frame, provides the support for the display and instructions. History: From 1534 to 1582 Oda Nobunaga played a key role in shaping the course of history in feudal Japan. His policy of unifying a country controlled by many feuding daimyo was furthered in a series of victories characterized by brilliant tactics and the first organized use of firearms. His unification policy became a reality under his successor, Toyotomi Hideyoshi, shortly before the end of the 16th century.